The 'Man of Steel' star, who is believed to be working on his relationship with his wife Danielle Spencer, apologised to his followers on Tuesday after a strange stock image of a naked woman's pubic region, which alludes to a hairstyle worn by some Orthodox Jewish males, appeared on his Twitter profile but insists his account was hacked. After deleting the picture, the 49-year-old New Zealand actor wrote: "Hey, I don't know what that was. Just having a chat with Dani when the phone went ballistic. Sorry, gone." 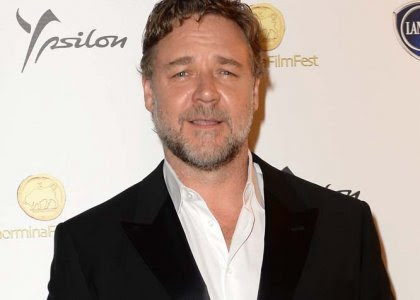 The 'Les Miserables' star's management team also claims that his account was hacked. Russell and Danielle enjoyed a family dinner with their sons Charles, eight, and Tennyson, six, at the Polo Lounge in Beverly Hills, along with a group of friends, last week. A source previously said: "They were both talking to their kids and being attentive. "Russell and Danielle were sitting next to each other and seemed to get along well - but were never affectionate." Although they never confirmed their marriage was over, Russell was linked to Natalie Imbruglia in February after it emerged that he and Danielle had "amicably split" in October after nine years of marriage. The actor thanked a fan for her kindness after she sent him a supportive message about the split but he later indicated that he hoped to resolve his problems with his wife, which he blamed on his busy career. In December he tweeted: "As soon as I finish this job and can get home, my priority is to try to bring my family back together. These latest reports are false and cruel."